BOL funny. Have a terrific toon Tuesday. 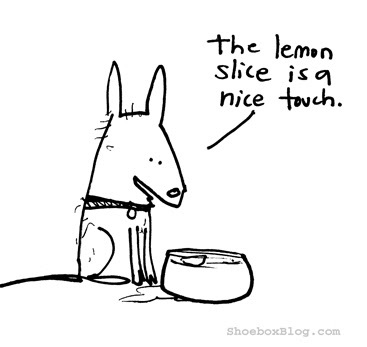 Haha - lemon slice in the dog water... I'm not sure what Shiner would do with that. Mom puts ice cubes in our water in the Summer! That will make your lips pucker up!!! MOL! Mommy says she so relates to this! MOL! We get bottled water and ice cubes. MOL. Moosey prefers to drink straight from the tap! Hee hee, the most ours get are ice cubes.. and I thought THAT was spoiling them! Nice when they appreciate our efforts!! So funny - the boys like ice cubes in their water.